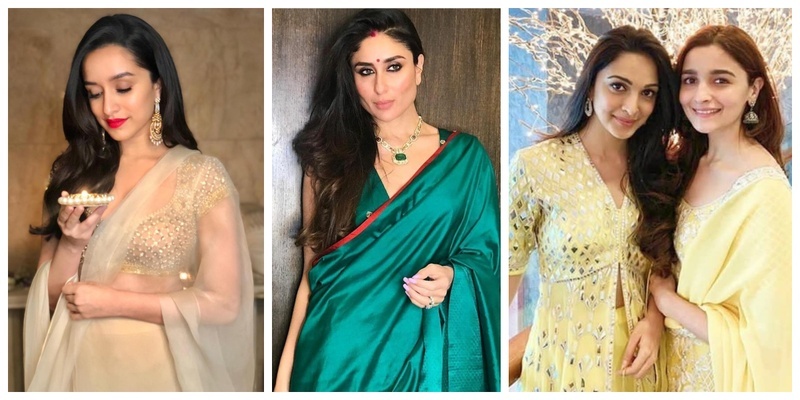 These celebrities' Diwali outfits are major wedding wear goals for this Shaadi season! Diwali often gives us an excuse to shed our inhibitions and act like children that we were once. Mum’s homemade snacks, the hundreds of diyas everywhere, the sound of firecrackers and of course the new clothes! I remember being super excited to wear the new clothes year after year and celebs are no different! Dressed in their finest robes, our celebs gave us major #DiwaliGoals. Here are some of our favourite picks from the B-Town Diwali party! Bebo’s emerald saree is enhancing her features even more! Love Alia Bhatt and Kiara Advani’s lemon yellow dresses! The A team, Anushka and Virat look so regal! Amrita Singh and Sara Ali Khan setting mother-daughter goals! Kriti Sanon looks ravishing in Red! Kajol and Ajay Devgn are the OG people! Aww..Varun Dhawan looks so cute with his longtime girlfriend Natasha Patel! Newly married couple Yuvika Chaudhary and Prince Narula are all decked up in emerald and white! Shahrukh Khan’s Diwali party was no less than a blockbuster either. So which outfit did you like the most?